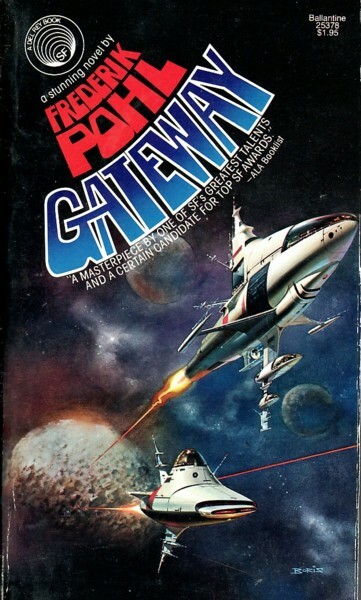 GATEWAY – Frederik Pohl (1977) | Weighing a pig doesn't fatten it. Gateway is a famous book. It’s one of the few novels that won 4 major prizes: the Hugo, Locus, Nebula and Campbell award, and it’s on numerous essential SF lists. While it’s perfectly self-contained, Pohl wrote 5 sequels: Beyond The Blue Event Horizon (1980), Heechee Rendezvous (1984), The Annals Of The Heechee (1987), The Gateway Trip (1990) and The Boy Who Would Live Forever (2004). Together with the 1972 novella The Merchants Of Venus, and The Gateway Trip – a short story collection that appeared in 1990 – these books form the Heechee saga. The Heechee are a mysterious alien race that explored our Galaxy hundreds of millennia ago. Near Earth, they left structures on Venus, and – crucial for this novel – a space station in an asteroid, including functional spaceships. Humans can operate these, but don’t really understand the technology. The basic premise of Gateway is brilliant: humans embark on voyages in these ships, but it’s a bit of a lottery. Most of the time, crews do not know where they’ll end up – there might be proverbial gold at the destination, but more likely it’ll be just a barren planet, or worse, mortal danger. The link with prospecting in the Wild West is easily made. The other thing that makes the book stand out is the fact that Pohl alternates between the story of the protagonist – Robinette ‘Bob’ Broadhead – enlisting on the Gateway station, a poor, lost soul trying his luck; and the same guy, years later, after a mission that made him a millionaire, visiting an AI psychologist to try and cope with the trauma that same mission caused. 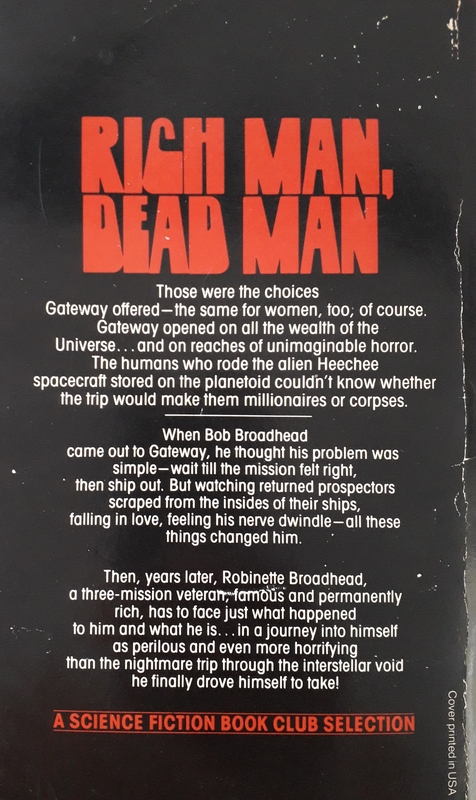 It provides the reading with an urgency: we get to discover Gateway and its workings together with Bob, yet from the start there’s a sense of impending success and doom at the same time. The narrative trick also keeps the reading varied: chapters alternate between good old fashioned space exploration in the Rama vein, and good old fashioned Freudian analysis. Then again, don’t expect an intricate psychological problem: it’s pretty clear early on that Broadhead’s main issue is a lost loved one. Bob is a coward, and he longs for the maternal recognition he never got. His 20% homosexual feelings stem from the fact that the only times his aloof mother touched him was to measure his temperature rectally. I had a hard time figuring out if that part was satire, something Broadhead made up to annoy his psychologist, or if Pohl meant it. I’m verging towards the latter. The Freudian stuff is dated and a bit goofy at times, yet Gateway remains an engaging read. That is quite an accomplishment actually, as about a third of the book are those therapy sessions. The strange part is I can’t really put my finger on why this book still works. I guess there’s enough of everything: enough mystery, enough character depth, enough space gadgetry, enough inward voyage, enough spaceship claustrophobia, enough dystopian social critique that’s still relevant today – it might not be intricate or complex, but it is all solid. The same goes for the book’s philosophical foundation – life is a lottery and we are all stuck inside it. It is simple enough, and true for that matter. Pohl doesn’t aim for the moral high ground, pretentious Hegelian synthesis or some hip Taoist revelation. These were the end of the 70ies, and people came down from their high. It isn’t clear from the onset, but Broadhead turns out to be a severely depressed character – some reviewers complain about him being an unsympathetic whiner, but I feel that’s very much part of his ‘symptoms’, so to say. If you need to ‘love’ your protagonists, this book might not be for you. Maybe the back cover says it all: “RICH MAN, DEAD MAN”, in a sturdy type font. Gateway is no nonsense, straightforward writing. It is not perfect, and I don’t think I’ll read the sequels, but 313 pages that are over 40 years old and for the better part still fresh and engaging: not a mean feat. You don’t need to be a lover of vintage SF to still enjoy this – if those therapy sessions don’t scare you, that is. This entry was posted in Reviews and tagged 1970s, Campbell Winner, Frederik Pohl, Gateway, Heechee, Hugo winner, Locus SF winner, Nebula winner, Review, Science Fiction, The Heechee Saga. Bookmark the permalink. This is one of the books I’ve been eyeing for a long time now – and indeed the literally treated Freudian stuff people were writing about was the main issue for me, but if you’re saying the book works despite that, I’m finally willing to give it a try 😉 Thanks! You’re welcome! I’m curious to read your take on it. I’m still not sure why it works. Probably because Pohl simply is no bullshitter here, and fairly good at poking through society’s veneer. I really liked this book. The mystery of the Heechee ships and the twist at the end are what did it for me. Have you read the sequels? It seems the Heechee themselves only appear in book 3 or so. Not yet. I liked Gateway enough that I think I will get around to reading them at some point. Imagine trying to choose one of those ships not knowing whether you’ll ever come back! I think I was expecting this to be a bit more adventure-y when I read it, with more made of the life-or-death choices represented by the Heechee ships…and then when I got an extended therapy session with a weirdly cheerful robot it sort of discombobulated me a bit too much. As such, I didn’t think much of it at first experience — though I loved the random pages of adverts — but it’s definitely grown on me with time. Another visit is probably on the cards, because with the benefit of a few years’ hindsight I imagine I’d get a lot more out of it. Yes the marketing is way off. The horror etc the backcover I posted talks about is not really the focus, not at all. I expected more too. It’s a strange book indeed, as I said a few comments above, I’m still not sure why I like it. Probably because I share something of Pohl’s outlook on stuff – isn’t that usually the ultimate reason we like books and are able to forgive certain flaws while those same flaws would have resulted in a negative review for others? When I read that, I knew I was going to finish the book no matter what. This is at the top of my classic reread list as I read it as a teen…. Now I’m a huge fan (*cough* -> because of Malzberg) of Freudian content in SF. I thought the sequel was a load of crud so I stopped reading Pohl for a while. I’ve gotten back into some of his earlier work but it’s quite average. Yes, browsing around a bit, I’m not inclined to read any other Pohl. Strangely enough, even though I could never warm up to the main character, his story kept me glued to the pages because I wanted to see how the journey ended. Yes I didn’t think Bob was really likeable either, and the fact the book keeps on being engaging nonetheless only makes it more powerful. Glad this worked, even if the Freudian stuff is dated. And it’s good that it’s still fresh and engaging 😀 Awesome review! Great review, as usual…. This was one of my favorites, and one the few classics that really got me into the genre. It’s uncomfortable in several places but just works really well. I’ll have to agree with the other comment about the sequels not living up to the original. The second and third Heechee books are ok but there’s certainly a feeling of diminishing returns. Pohl is obviously a very good writer but he might have caught lightning in a bottle with Gateway. I think the Freudian parts are satire, using stale ideas about the human mind to go with the old-West flavor of the exploration chapters and Broadhead’s occasionally neanderthal behavior. I say this after reading 1950’s-era Pohl and Pohl/Kornbluth SF, where the satire was just as sharp but less disguised. A great Vallejo spaceship painting to boot. Thanks! If it is satire, and you make a solid case for it, the book is even better, as its most troubling ‘dated’ aspect actually turns out not to be dated at all. The question then becomes whether Pohl did his job (as in ‘got his message across’) as I did not come across one contemporary review that mentioned the satire, and I’ve read quite a few. I’m wondering what 70ies reviews said about it, but sadly that part of SF fandom is hardly found online.